While taking a stroll in Meridell, you happen upon a small pond full of Mortogs! In the middle of them sits a warty Grundo wearing a paper crown. 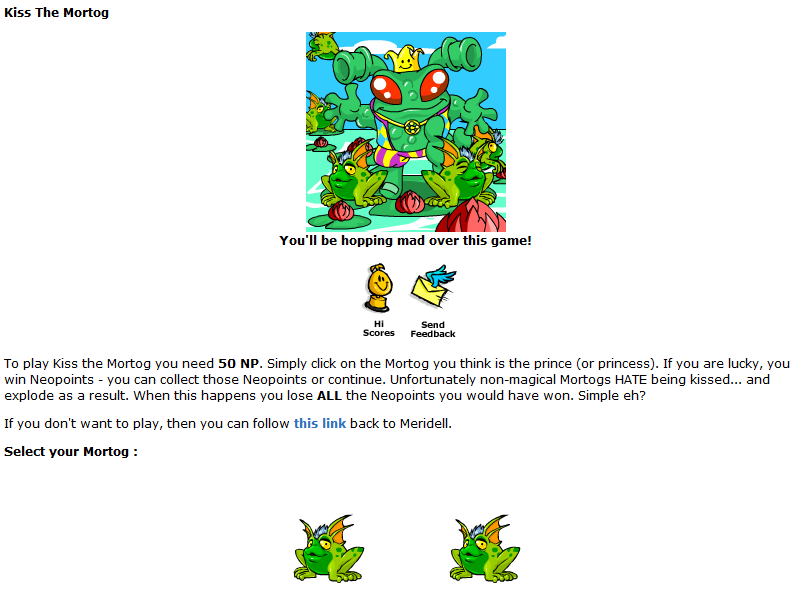 He croaks loudly in greeting, "Kiss the Mortog is all the rage in Meridell! If this is your first time, don't fret, you can't get warts from them." Since there is no way to discern the magical Mortogs from the regular ones, winning is completely based on luck. If you're curious about the odds of picking the correct Mortog for each round and the prize payout per round, the table below can help. Probabilities are based on consecutively picking the correct Mortog for each round preceding it. Thanks to Eleven for providing information on round 8. If you are kissing Mortogs for the avatar, you must quit after you complete level 4, when there are 5 Mortogs to choose from. Going beyond level 4 and quitting will not award the avatar. If you are trying for a trophy, the minimum requirement is usually higher than this, so check the high score table before you start playing. Remember, it's always best to play during the beginning of the month when the tables have been reset! I don't want to play anymore!! This page was last updated on October 3, 2018.